"I got a call from my husband's office and they said he was admitted in hospital for an emergency. I was shocked. 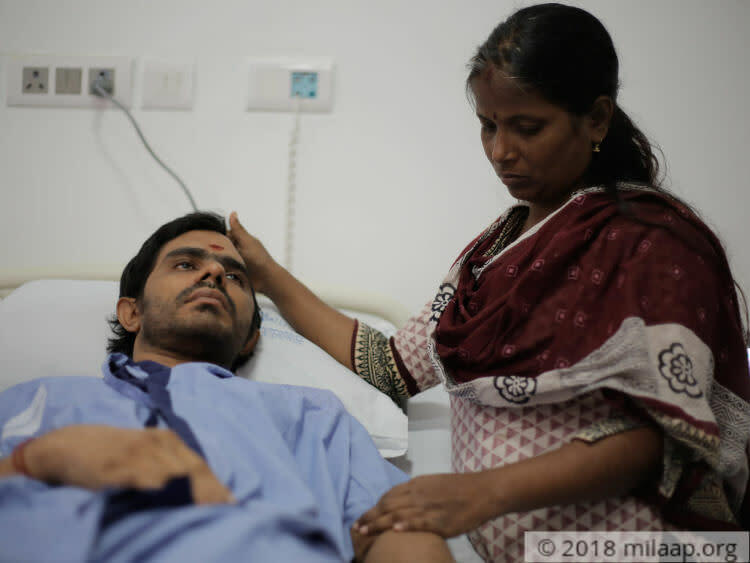 He had blood clots in the brain and his right side was fully paralyzed; doctors told us that his skull has to be removed. It has been 6 months now since he collapsed suddenly. We have a 4-month-old baby, but Sathish is also just like a child now, learning how to say words like 'Amma' 'Appa'. all over again I'm waiting every passing minute for him to speak and walk on his own " - Saraswathi, wife of Sathish. 36-year-old Sathish has always been a calm and kind person. He was a great source of strength to his family and friends. He has always stayed positive. It is hard to believe that his anxiety and stress skyrocketed and caused terrible damage to his brain. 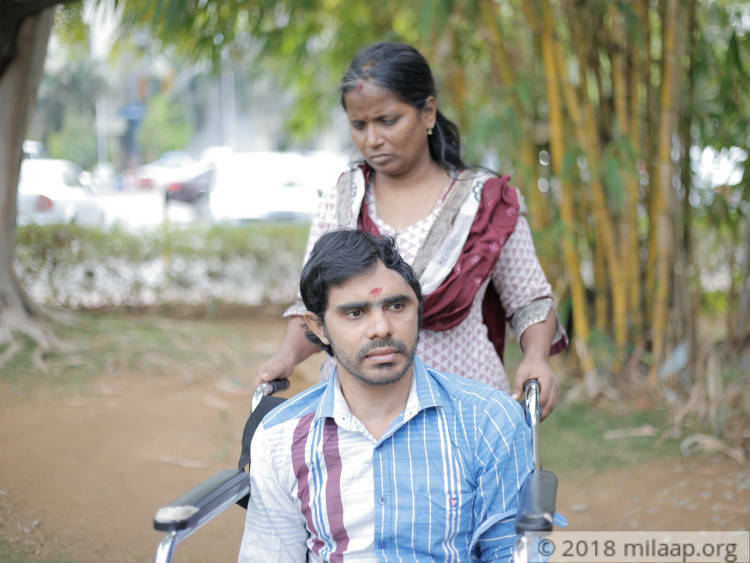 10th January 2018 was just another day at the office for Sathish, his wife Saraswathi who was pregnant then was waiting for him to come back home not knowing that their lives would never be the same forever. 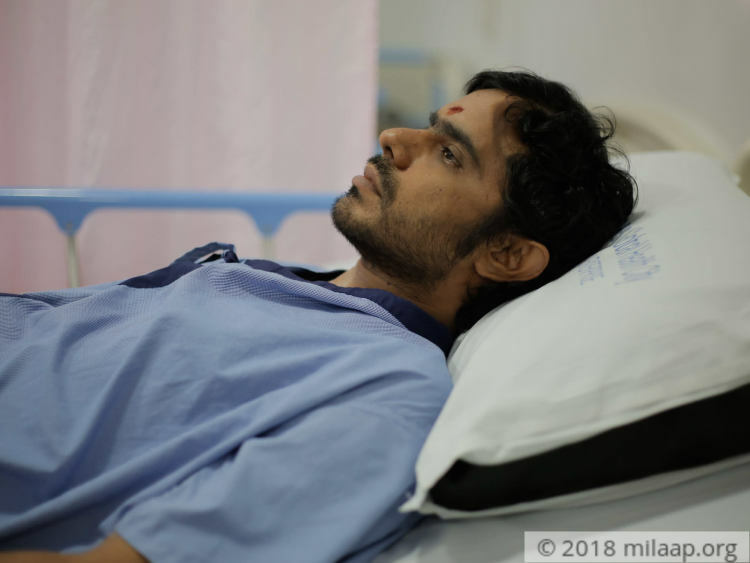 Sathish suddenly fainted in his workplace and lost consciousness. His friends rushed him to the hospital and on his way he even got seizures. "He was very critical and the local hospitals nearby asked him to take to another hospital. We were already 1 hour late when he was finally admitted to the hospital. Just by looking at him I know he is very serious, but I hoped he will be normal soon. Within few days I realized normalcy is a distant dream yet I did not give up. Even slightest movement of him like raising his hands slowly, gives me hope. I will not let him down at any point of time even if that means sacrificing my life." - Saraswathi. 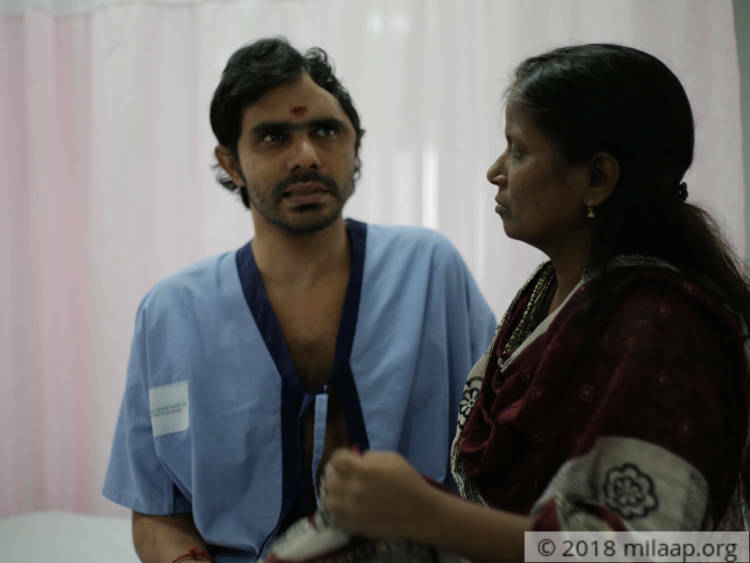 When Sathish was admitted to the hospital an immediate decompressive craniectomy was done, it is a surgical procedure in which part of the skull is removed to allow a swelling brain room to expand without being squeezed. Usually, bone flaps are replaced after 3 months of the surgery. But very soon he had fluid accumulation so the bone flaps were replaced on the same month. 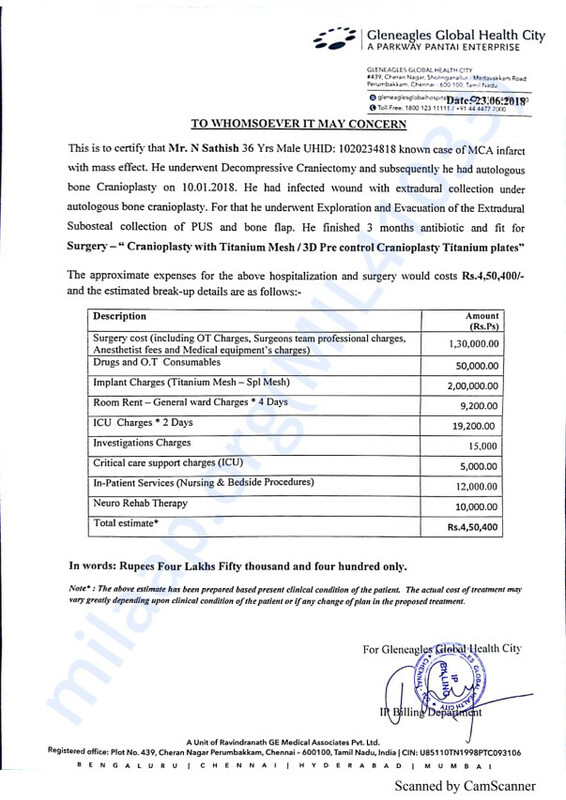 A third surgery was done to remove the skull again because of infection. "Within a blink of an eye, he had 3 major surgeries. I was 7 months pregnant then and I had to deliver my baby prematurely. My baby was in NICU was 2 months, I do not know how I survived these days but I know deep in my heart I have to be strong for my husband and my son. My mother was taking care of my newborn while I was next to him, talking endlessly about our baby and our dreams with a hope that he will come back to me soon." - Saraswathi. 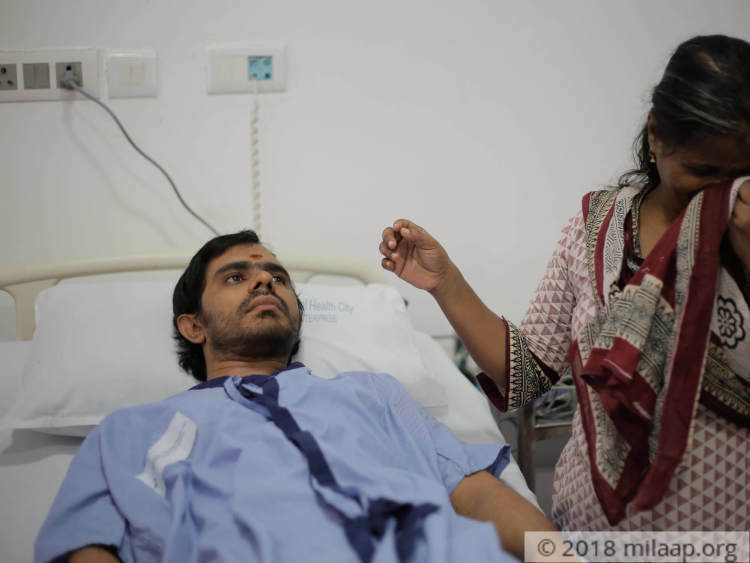 Sathish has been in the hospital for 6 months although the damage was extremely severe, he had shown slow but tremendous improvement. He is now able to walk with a support, he has slight movements in hands. He is now able to say few words. He has a 90% chance of recovery if the surgery is done. "Ours was a love marriage so we did not have support from our families but after knowing his condition our parents came to see us. His colleagues and friends have helped us a lot. Yet there isn't even one day that I had sufficient funds. I was struggling to even buy medicines for my husband. Physiotherapy was expensive but seeing my situation therapist agreed to give therapy at a low cost but we have a long way to go." - Saraswathi. 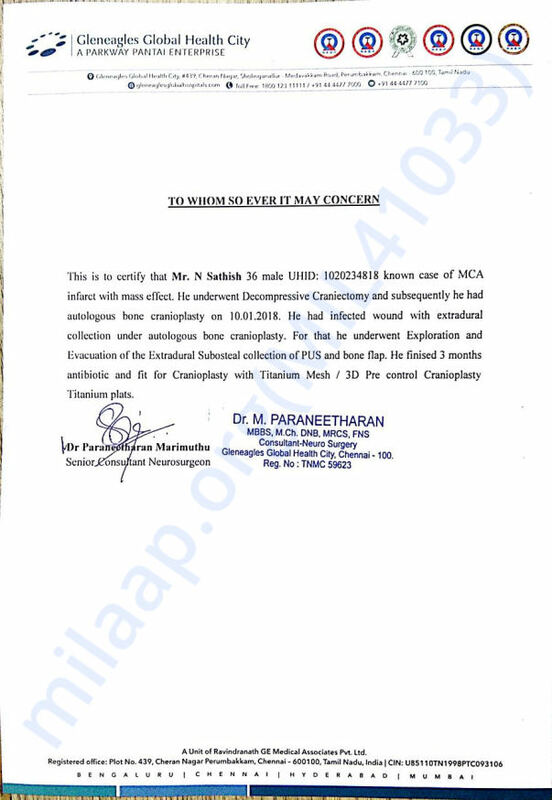 37-year-old Sathish, now a father of a 4-month-old child is suffering from severe brain damage and paralysis. A part of his skull has been removed and he needs an urgent surgery to repair the skull damage. He needs physiotherapy and speech therapy to do activities on his own. 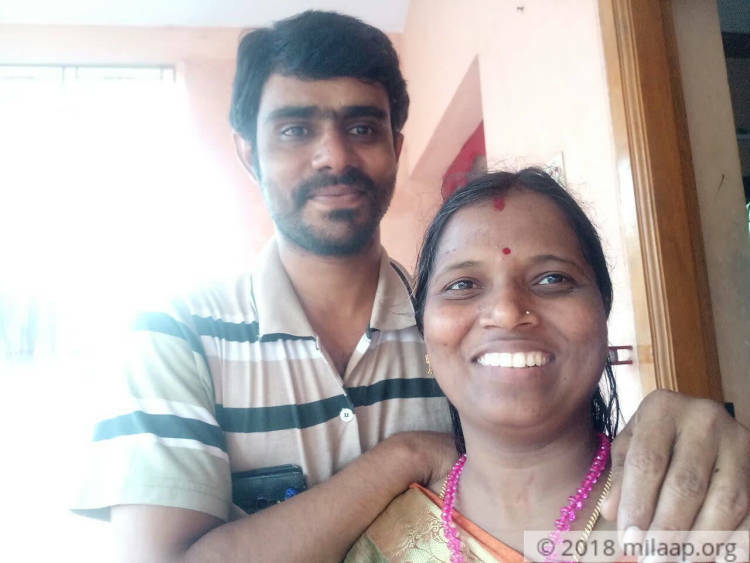 His wife Saraswathi has been struggling all alone and has tried all the ways possible to fund his treatment. Now she needs your help. Without your support, Sathish and his family can never live a normal life. We have some news to share. Sathish is doing fine now and he is continuing his Physiotherapy. He started walking on his own and started to do all the basic physically activities by himself. The major injury in the skull is cured completely. Doctors have advised him to engage in more physical activities. We will keep you posted on further updates. 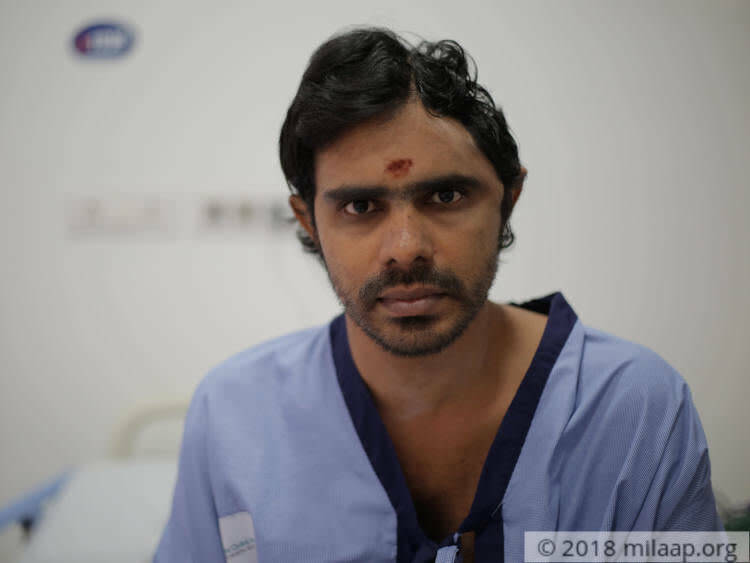 Sathish underwent a successful surgery (cranioplasty). He is currently at home and recovering. He is undergoing physiotherapy and speech therapy for now. Doctors are suggesting he will undergo the same for a while. We're really thankful for the love and support which you have shown towards us, we shall keep you posted. My husband, Sathish is now improving. His surgery (cranioplasty) is scheduled for sometime this week. He is at home currently and on medication. We are all hopeful about his recovery and are praying for the best of his health. Please keep praying for him and supporting us. We shall keep you posted.